Inheritance is a widely used concept in modern object oriented software engineering. Previous studies show that inheritance is widely used in practice yet empirical data about how it is used in practice is scarce. 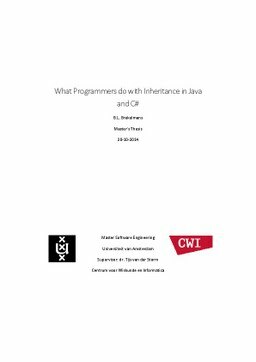 An empirical study into this subject has been done by Tempero, Yang and Noble titled “What Programmers do with Inheritance in Java” . This study replicates and extends the study by Tempero et al through inclusion of C# and explanation of the differences and similarities between the languages with respect to practical use of inheritance. It contributes towards the validation and broadening of original conclusions. This study presents a comparative analysis of 169 open source C# and Java systems totalling around 23 million lines of code. Interesting findings are presented on the potential effects of forbidding implicit dynamic binding and inferring types for local variables on the practical use of inheritance amongst C# and Java open-source systems. Brekelmans, B. (2014, January). What Programmers do with Inheritance in Java and C#. Universiteit van Amsterdam.